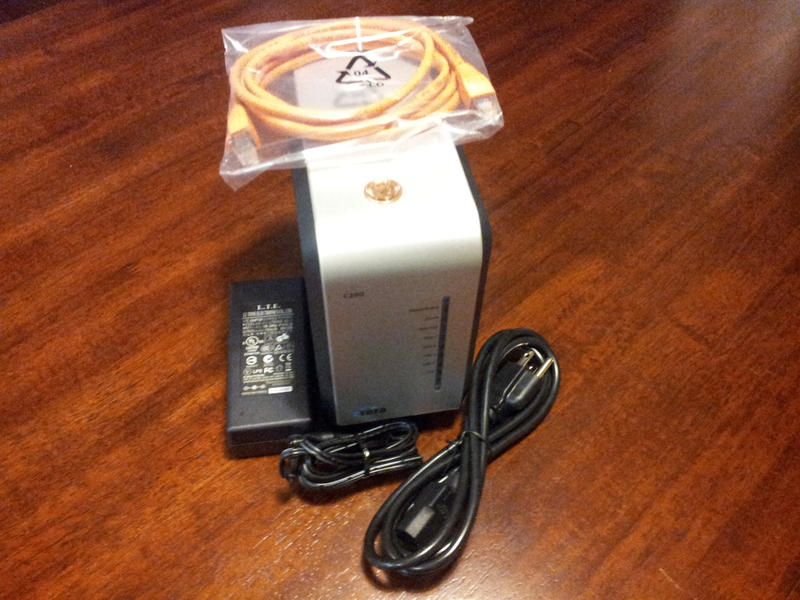 This review focuses on CTREA C200. However, the review also equally applies to CloudPlug, C400, and C800, as they all use the same web interface and codes. CTERA Networks has been in the news in the recent months for a variety of reasons. The company was named the Champion and Trend Setter in Cloud Backup Gateways by the InfoTech Research Group in their vendor landscape report titled “Cloud Backup Gateways.” CISCO in its Partner Summit in April 2012 announced that they have embedded CTERA software (under E-Series Cisco UCS platforms) in its Integrated Services Router(ISR) G2 platform for improving access, availability and security of cloud applications. Swisscom IT Services launched cloud storage services that are powered by CTERA networks. CTERA Networks announced the availability of Apple iOS and Android Mobile App for secure file access and sharing in the cloud. This privately held company is headquartered at Petah Tivkah, Israel and Palo Alto, California and has a number of offices in other parts of the world. It offers a range of highly cost effective, hybrid data protection solutions to small and medium enterprises. CTERA’s solution combines a cloud-side management platform (CTERA Portal) with managed appliances and software agents that together deliver a comprehensive storage, backup and file sharing solution that is a hybrid of local and cloud storage, bringing together local performance and the scale and accessibility of the cloud. The solution is sold through a network of resellers and MSPs (not directly by the company) and typically includes an appliance such as the one reviewed here and annual or monthly subscription to cloud services that depend on the service provider. CTERA’s aim is to empower its partners to be active in providing managed cloud services. The NAS Storage products include, CloudPlug (no bigger than an AC adapter weighing 300 g), and the C-Series (with 2, 4 and 8 SATA 1TB drives named as C200, C400 and C800). CloudPlug sells for $199, which includes one year of 10GB of online storage. The price for the C-series starts at $499 with a few bonuses attached on purchase, such as a 10GB of online storage for 30 days. Additional 10GB of online storage can be purchased at $9.95 a month or $110 a year. These are indicative prices (MSRP) and may vary according to volumes and the service provider. The network attached storage appliances facilitate clientless backup of local desktops, laptops, servers, and other hand held computing devices. The devices have to be configured with the appropriate application aware CTERA agents for the backup to kick through. CTERA Workstation agents work only with Windows 7, Vista or XP and Server Agents work with Windows 7, Vista, 2003 SP1, 2008 or 2008 R2 Server, Linux (SUSE/RHEL/Ubuntu). 20 workstation agents are automatically included in the package. Additional agents can be purchased. NTFS, FAT 32, EXT3 and NEXT3 file systems are supported with the default file system being EXT3. File sharing is enabled with Windows File Sharing (CIFS), Apple File Sharing (AFP), NFS, Time machine, Rsync and WebDAV. UPnP and Bonjour discovery are used for network discovery in Windows and Mac systems respectively. Re-sizeable logical volumes can be created. Thin provisioned multiple snapshots can be taken with Next3. AES 256 Volume encryption is used to encrypt data. Microsoft Active Directory support is available. Full text search is facilitated. The Web based user interface requires MS Internet Explorer 7 and above, Firefox 3 and above, Chrome 5 or newer. User management is role based. Users can be assigned rights and permissions and provided with disk quotas. Usage data can be logged, viewed and monitored in real time remotely. Custom email alerts and reports can be generated per user per usage basis. The device is optimized for incremental cloud backup with data compression and 256 bit AES encryption, SHA-1 finger printing and secret passphrase. Data is transferred over 128 bit Secure Socket Layer (SSL). Block level and global level deduplication is automatically triggered on backup. Previous file versions can be retained in “nested snapshots”. Backups can be scheduled to kick start automatically or can be manually initiated. Multiple users can synchronize their systems with the files stored in their cloud backups simultaneously. Backups can be seeded offline. Backup sets can be constructed by selecting specific folders or defining file attributes. Open or locked files are also backed up. Project based and time limited invitation based collaboration is facilitated for all kinds of backup. The backup in the cloud can be accessed from anywhere, anytime and restores can be initiated using Windows Previous Versions, Virtual Cloud Drive, Local appliance, Web Interface or using the CTERA Portal. Data can be recovered bare metal to same or similar hardware as the source from which the data was backed up or to a Virtual machine. 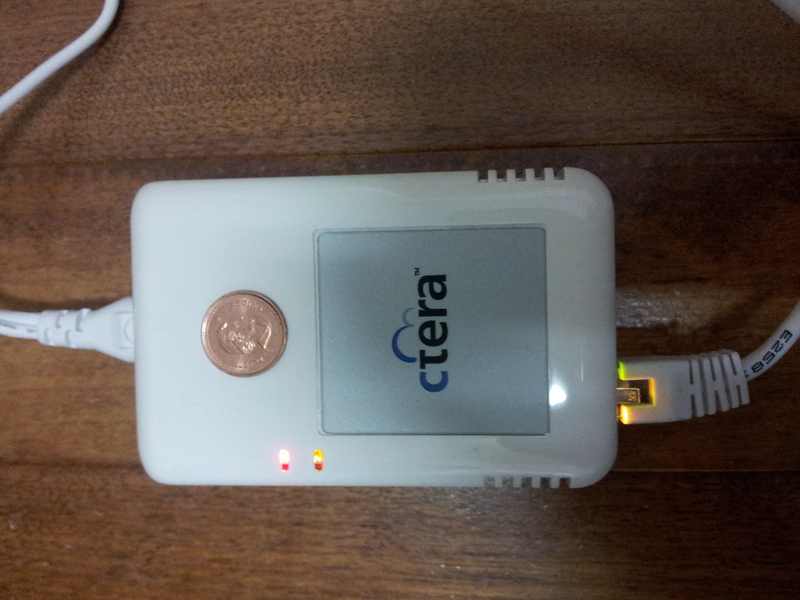 CTERA devices are not power guzzlers. The CloudPlug consumes 5W max and the C-Series require 50W, 250W, and 256W max for its C200, C400 and C800 devices, respectively. The operating environment must be maintained at 0-40°C (32 to 104°F), humidity of 5%-90%, non-condensed. 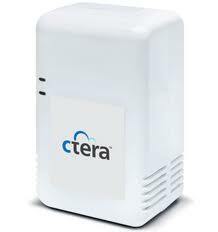 CTERA hybrid storage solutions are ideal for distributed environments in which there are a variety of storage services to be managed (such as backup and recovery from diverse computing devices, cloud on ramping, and file sharing and collaboration) and monitored from a central location securely and effectively. Even enterprises that are new to mobile access will find this service easy to deploy, manage and monitor. The different Network Attached Storage (NAS) devices marketed by CTERA use similar installation wizards and software interfaces for access and management of the device and the cloud backup connection. So, the learning curve is short and users can acquire expertise in the use of more than one CTERA device by just familiarizing themselves with one device. However, the company believes in supporting its customers and even hand holding them until they find their feet. Elaborate help files, FAQs, videos and usage tips are available on the website of the company for troubleshooting or learning. The device also comes with an installation manual that contains a pictorial and textual step by step walkthrough of the installation and configuration process. CTERA is definitely recommended for small and medium enterprises looking for a hybrid solution for their storage and disaster recovery needs. These prices are Manufacturer Suggested Retail Prices (MSRPs) and may vary according to volumes and the service provider. For the appliances, they don’t include disks or cloud storage. What they do include are workstation agent licenses. However, many CTERA partners offer bundled solutions. For instance, an MSP may not charge their customers for the appliance but provide a monthly price for the service which includes everything. 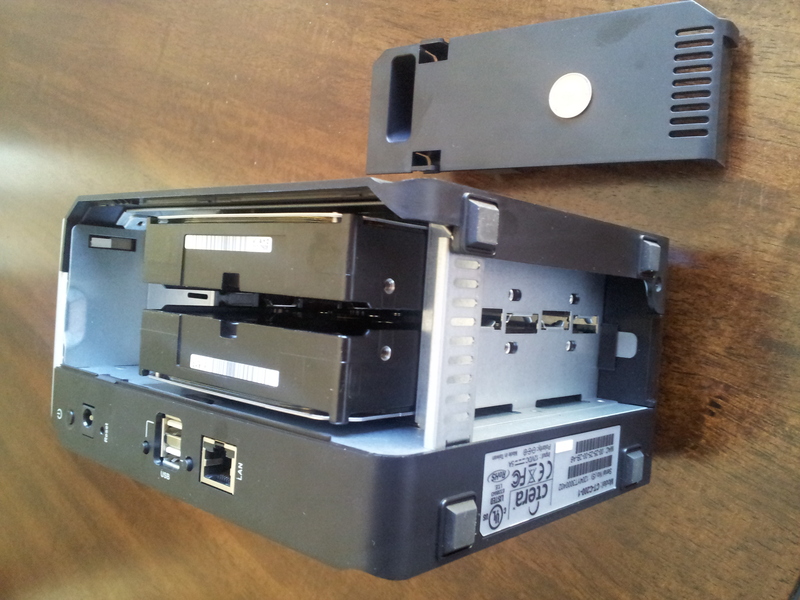 Some partners charge separately for the appliance, often bundled with HDDs, and for the cloud storage/service. With (included) Workstation Agents for Windows PCs, or with separately purchased Server Agent for Windows servers and Linux. This is for the agent. To run the appliance, you only need a browser. Positioning: CTERA seamlessly combines the benefits of local storage and cloud storage to deliver a cost-effective, performance optimized and secure solution for backup, file sharing & sync and mobile collaboration to SMBs and enterprise remote offices and branch offices (ROBO). The company empowers its partners – service providers, resellers and distributors – to launch and manage cloud storage services that generate recurring revenue while adding value to their customers. Competitors: All NAS manufacturers for SMBs; Backup software providers (Symantec, Acronis), cloud backup services, and hybrid backup vendors (Axcient, Barracuda). CTERA doesn’t sell directly to consumers, sells only through channels. CTERA agents work only with workstations with Windows 7, Vista or XP and servers with Windows 7, Vista, 2003 SP1, 2008 or 2008 R2 Server, Linux (SUSE/RHEL/Ubuntu). Mac agent is in the works. Agents are required for Exchange/SQL./AD server backup, for bare metal and for laptops if you want them backed up when not attached to the LAN. 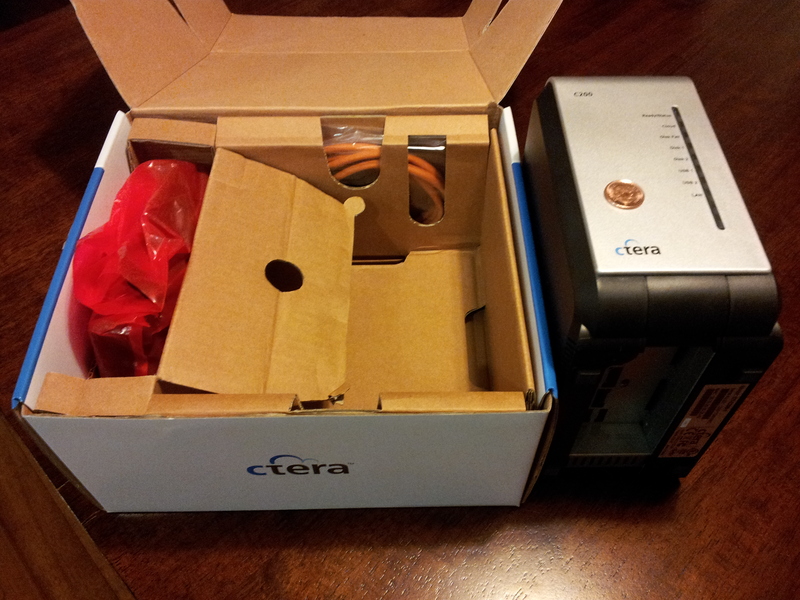 CTERA C200 Package contains the C200 device, a power supply cable and an Ethernet LAN cable. The device is small and compact. 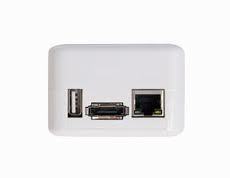 At the rear of the device are all the slots you need for inserting the power jacks, USB drives, Ethernet cable and the LAN Cable. 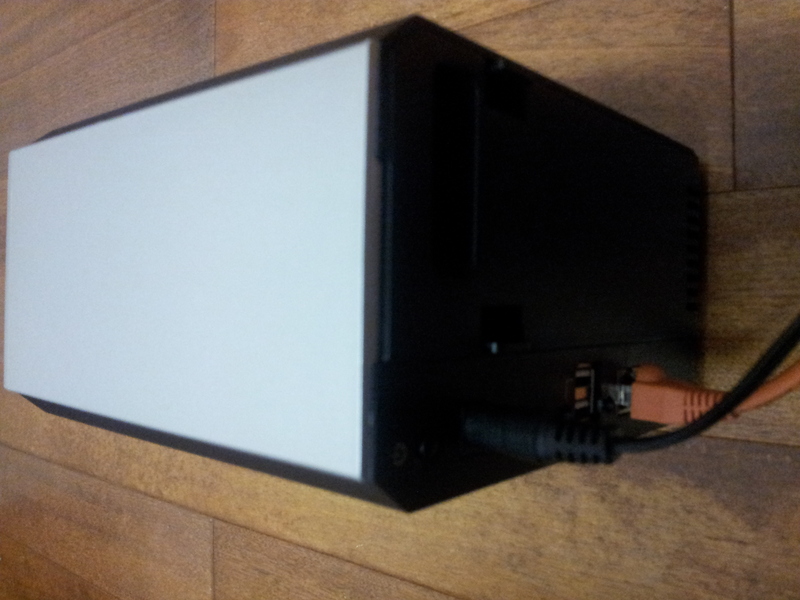 The Back cover opens to permit the insertion of two SATA drives. There are also a number of buttons that perform specific functions. There is the Power control button, the device restart button, and the USB eject buttons. The front of the device has a number of LEDs that indicate the status of the device vis-à-vis power, connectivity to the cloud or attached drives. The device requires one hard drive (SATA 3.5”) and a network connection or router that is DHCP enabled. If the device Web interface is to be used, the user must have Microsoft Internet Explorer 7.0 or later, Mozilla Firefox 3.0 or later, or Google Chrome 5.0 or later installed. Adobe flash player is also a software requirement. If remote PCs and mobile devices must connect to the device, the firewall for incoming TCP ports 995 and 873 must be opened for the CTERA device. The device is automatically detected using UPnP and appears in the list of network places on the Windows machine. 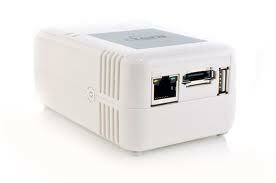 To access the device, view the network places from a PC machine connected to the same switch or router as the device and double click the CTERA device. If you are accessing the device using a MAC machine, run Safari. Open Bookmarks>Collections>Bonjour and then expand webpages. Double click on the name of the device. The Welcome to CTERA screen the request for input on User name and password is the first screen to appear on establishing the connection. This information is required for registering the Administrator. The information can be changed by accessing “Adding and Editing Users” under Manage Users. Clicking Save activates the Easy Storage Set up Wizard. The CTERA CloudPlug™ is an elegant solution for the file sharing, data backup and synchronization needs of branch offices, teleworkers and SOHO users. A small form factor device with a powerful server inside, the CloudPlug converts any external USB/eSATA drive into Network Attached Storage with secure cloud backup, remote access and collaboration services, and allows to share and synchronize files on your local network. The Set up Wizard facilitates basic configuration of the C200 device. While the default file system is EXT3, other preformatted systems like FAT32, NTFS, EXT3, NEXT3 are also supported. The Proposed actions screen, the File Sharing Screen, the Accounts details screen, the Backup Encryption Screen, the Backup Passphrase screen are displayed to obtain user inputs. While the first two screens suggest beneficial settings to the user, the Accounts details screen can be skipped for when the user chooses to set up the Portal account. The Backup Encryption and the Backup Passphrase screen are the most important screens. Users can choose their own encryption key or Passphrase or choose to let the system generate the key for them. Additional security is available when the key is selected by the user. “Main” is the first screen that appears after login. The Main page contains a number of clickable links and tabs for additional and quick access to the submenus contained under the drop down menus of the Navigation Pane. The Navigation Pane, itself provides access configuration and management options useful to the device administrator and user. The default tab is the Configuration tab. The File tab contains the file manager which enables access to files and folders on the device. Connected CTERA Agents can be viewed from the My Computers tab. The Navigation Pane on the left of the screen contains 12 options with cascading menus attached. The menus can be opened by clicking on the Navigation button with the appropriate legend. The status bar at the bottom of the Main screen (and all other screens of the application) contains three buttons—Logout, Restart, Help on the left and legends on the right giving portal particulars and user information. Administrators can view the device details by Navigating to Main>This Device. The serial number and other device particulars are displayed. Details of attached USB based UPS devices and their status can be viewed by navigating to System>UPS. The Administrator can configure the appliance name and location by clicking on the Edit buttons available on the screen. The firmware can be manually updated by clicking on the Update Firmware and entering the information on the screen that appears. To ensure that the firmware is automatically updated the Administrator can configure the device by navigating to System>Firmware>Settings and checking Download and install updates automatically. Date and time can be configured manually or automatically synchronized with a Time server by navigating to System>Regional Settings. 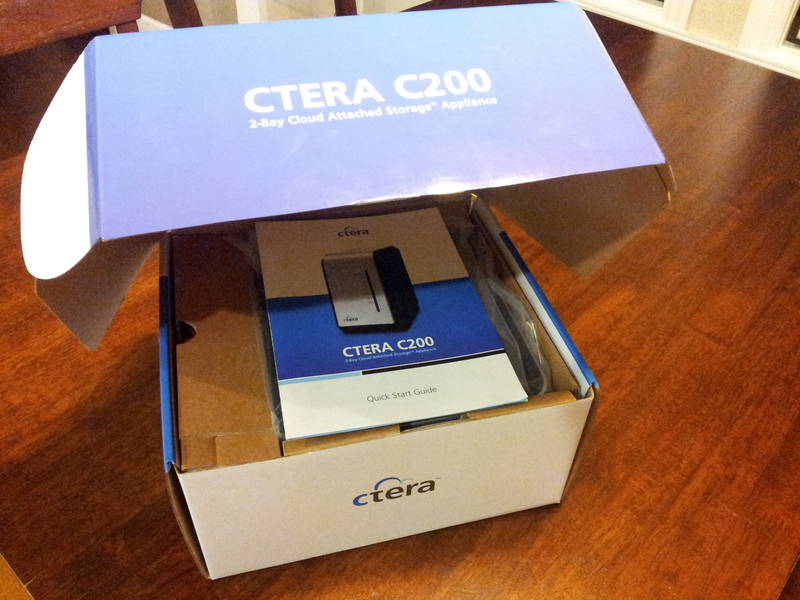 CTERA C200 automatically backs up CTERA device configurations to the CTERA Portal the moment the cloud backup runs and this can be downloaded and restored as needed. However, the configurations can be manually exported to a *.xml file on a computer connected to the network and this file can be used to restore the configuration settings of the device. To manually export the configuration settings the Administrator will have to navigate to System>Configuration Tools>Export. To import the file, the import option must be selected and the file named in the import dialog box. On clicking Upload the file gets uploaded to the device. Any errors that may occur during import and upload will be displayed. If the appliance has to be reset to default settings via the web interface, the administrator can navigate to System>Configuration Tools> Reset to Defaults. Alternately the appliance can be reset by pressing the reset button at the rear of the appliance for three seconds till the LED flashes red. Thereafter, the button will have to be released and pressed again for ten seconds or till the boot process kick starts. The device must not be powered off suddenly. To shut down the device using the web interface, the user must click on the shutdown button in the status bar or keep the power button pressed down till the C200 shuts down. Failure to follow the procedure can result in loss of data. If the device is experiencing problems, the administrator may like to restart the device. The device can be restarted by using the reset button or by clicking on restart in the status bar. Power usage by the appliance can be configured by navigating to Storage>Power Management and checking/selecting the appropriate time frame in which to put the hard drive to sleep if the user is inactive. The status dashboard (Navigation: Main>Dashboard) gives the administrator a bird’s eye view of the device’s current status such as the disk drive and volume information, resource utilization information, scheduled backup operations, and recent log of events. The hard drive can be in one of the three states—ok, fail or unrecognized. Arrays can be Optimal, degraded, fail, or syncing. Volume status can be ready, not ready and formatting. Users can drill down to details on the hard drive, array or volume or initiate actions by clicking on appropriate links on these screens. The activity monitor (Navigation: Main>Activity) provides an overview of the device’s recent activities such as disk read/ write rate, CPU /Memory usage percentage. Event logs can be configured and viewed using the Event Log>Log Settings. Logs can be activated for System, Local backup, synchronization operations, cloud backup, restore operations, user access, audit, and CTERA agent events. Controls available at the bottom of the log page can be used to navigate between the pages of a log. Log filters can be set to display only logs with a minimum log level. Categories of logs can be eliminated by using the “Clear” option. Logs can also be exported to Excel sheets. 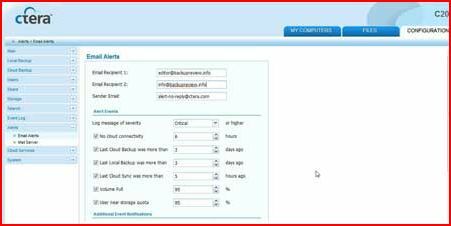 Email Alerts and Mail Server settings can be configured. Mail can be delivered using a custom SMTP server by selecting the appropriate options and entering the required information in the Alerts>Mail Server configuration screen. Email alerts can be generated (Navigation: Alerts>Email Alerts) by inputting appropriate information in the fields. By default CTERA C200 obtains the IP address and DNS server particulars from the DHCP server. However, if the network IP is static, the device must be configured using the Network Setup Wizard. The inputs required for the network setup must be carefully entered as incorrect entries can result in loss of network connectivity for the device. 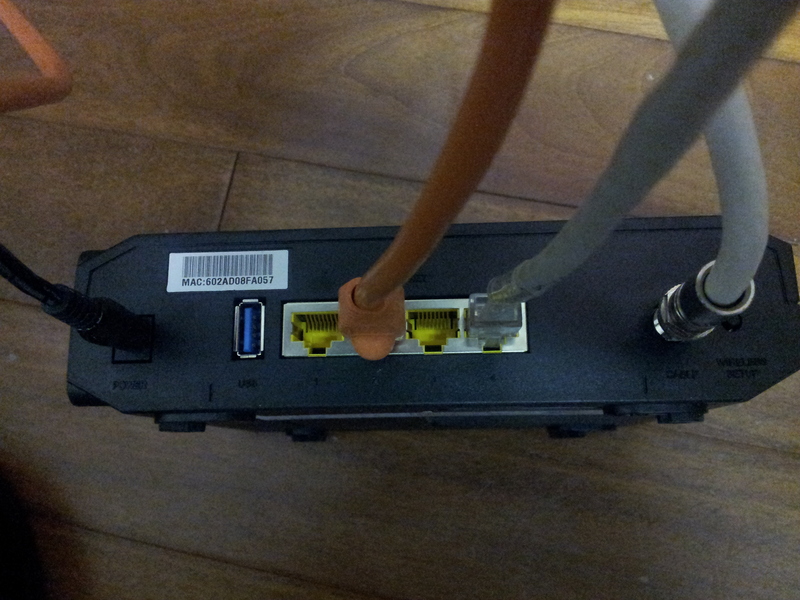 The Ethernet Port (Navigation: Network>Port Setup) link speed and duplex are automatically detected by default. However, the speed and duplex of a specific port can be restricted manually. Jumbo frames can also be configured up to a frame size of 9000 bytes with the stipulation that all the computers on the device’s network must be configured to the same Ethernet frame size to avoid connectivity issues. The network status can be viewed in the configuration pane (Network>Status). The device status, the IP address, the expiry date of the lease, the default gateway, the Primary DNS server, the secondary DNS server, the connect duration, Ethernet link and MAC Address are the details that are displayed to the user. The DHCP lease can also be renewed from this page. Cloud backup, remote monitoring and reporting features of the CTERA C200 are only available if the device is connected a CTERA Portal account. As a first step, use the Web browser to open http://portal.ctera.com or the address provided by the service provider from whom the device was obtained. The User sign up Wizard guides the user through the sign up process starting with the verification dialog box that ascertains that a human user has started the process and ends with the user agreement to the terms of service check box after the personal information of the user has been obtained such as first name, last name, email, user name and password. A confirmation of the Portal account is sent to the email id provided by the user. The next step is to connect the CTERA C200 device to the cloud by clicking on the “Connect to Services” under cloud services. The Connect to Services Wizard displays the Accounts Details dialog box for inputting the information about the Portal account such as the Portal Address (host name of CTERA Portal), the user name and Password fields. The device then connects to the CTERA Portal and makes available the cloud services to the device. Service details can be viewed or edited by the administrator. The services can be enabled or disabled, reconnected or disconnected to suit the needs of the enterprise. Storage is divided into standalone drives or arrays on the C200 device. An array consists of one or more physical hard drives that are categorized as linear Concatenated JBOD (Just a bunch of disks), RAID0 (Striped), RAID1 (Mirrored). CTERA’s larger appliances, C400 and C800 (4-bay and 8-bay respectively), also support RAID5 (Striped with distributed Parity), and RAID6 (Striping with dual distributed Parity). Each type of array provides a unique method of data distribution, storage reliability and capacity. Hot swapping is only possible with RAID1 (mirroring) or RAID 5/6 without loss of data. (A RAID 1 (mirroring) and RAID 5/6 arrays can be enlarged to store up to 1 TB of data by hot swapping). Arrays are further subdivided into volumes (logical partitions) such as Network attached storage (NAS) volume which has a file system and acts as a file server and can be accessed by any device that has device-supported file sharing protocols. It is possible to take snapshots of the NAS volumes. The Storage Area Network (SAN) volume (also called RAW) is unformatted and not readable by the device. File sharing, synchronization and cloud backup is not possible for SAN without defining an iSCSI target. Arrays can be added, edited, deleted. At a more granular level, volumes can be added, edited or deleted. Logical volumes can also be scanned and repaired. Read only snapshots of volumes can be automatically or manually taken. (However, files and folders from a Cloud/NEXT3 snapshot on your computer can be restored using the File Manager, provided Windows File Sharing (CIFS) is enabled.) The list of available snapshots can be viewed, accessed or deleted. Retention policies for snapshots can be defined on a daily, weekly, monthly or annual basis. Data residing in various computing devices, including mobile devices, in your network can be backed up to the C200 device only if CTERA agents have been installed on a network share on the machines. 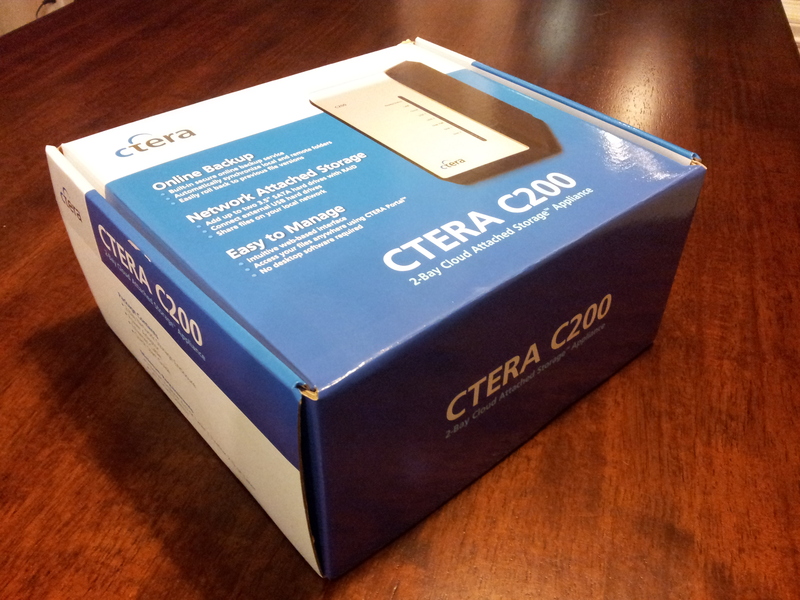 20 workstation licenses come packaged with the CTERA device. Server licenses have to be separately obtained. Additional workstation licenses can be obtained from the CTERA authorized reseller. CTERA Agents (Server or Workstation) can be downloaded and installed on the computing device by navigating to Local Backup>CTERA Agents>Agent–> install Agent. The CTERA Agent installer wizard guides the installation process till the finish screen is reached. Once installation is complete the Agent (Server or workstation) must be activated by connecting the agent to the device and configuring it. To connect the agent to the device, right click on the icon in the Windows Taskbar and Open Agent. The Sign in Window appears requesting device details. The computing device then connects to the C200 and you are ready to backup information! By default, the Agent supports File level backup (locked and unlocked files) and Disk level backup (Bare metal backup) to physical or virtual machines. The Administrator can centrally manage all CTERA agents installed on different computing devices and define global settings for all machines or specify custom settings for specific machines. The administrator can also delegate the task of customizing the agent to the user by providing the user with the necessary permissions for configuring the agent installed on the user machine. Agent specific settings can enable file level backup, files and folder backup during file level backup, application backup during file level backup and volume backup during disk level backup. User management begins with addition of users or groups of users to the device Web Interface. The user/groups must be granted access rights to network shares. Administrative users can be given Read only Administrator rights or full administrator rights. 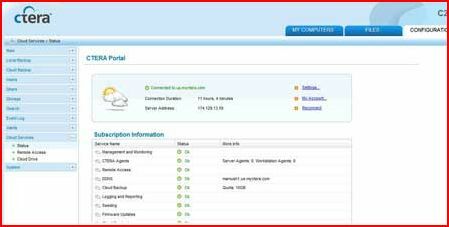 Users who do not have administrative rights cannot view the configuration tab on the Main screen. Administrators and users with permissions for configuring the Agent on their machine can select files and folders for backup to the C200 device. But, only administrators with read/write permissions can schedule backups. The administrator can configure the device to create home directories for specific computing devices on first login. Backups can be scheduled by opening the CTERA Agent Manager and clicking on the File level or Disk Level backup tab and overriding the general settings. The backup schedule parameters can be specified in the Schedule backup dialog box that appears on clicking the Schedule backup button. By default file backup or disk level backup happens every 24 hours. File and folder backup/ application backup or volume backup must be specifically enabled on the Agent interface by selecting the relevant check box for local backups to happen. Files and folders for backup or applications or Volumes for backup can be selected by clicking on the browse button (button with three dots) next files and folders/ applications/ volumes to backup and selecting the files and folders /applications / volumes from the tree view. Once the files and folders or volumes have been selected, the user has to save the selection and enter the destination to which the selected items must be backed up. Alternately if you wish to have the facility to select your files and folders from Windows Explorer the “Display icons in Windows Explorer” check box must be selected and settings saved. In the Windows Explorer select the file or folder and right click on it to display the submenu. Select CTERA Backup>Add to Backup. To remove the file select Remove from Backup in the sub menu. CTERA agents will then automatically backup files, applications and volumes to the device according to the schedule that is configured on the device by the administrator. Backups can be manually initiated by invoking the CTERA Agent, selecting the backup type and clicking Go. A backup operation for a specific agent can be stopped or viewed from the CTERA Agent interface or from the CTERA Agent Manager. To restore a backup the Restore Tab is to be clicked and the backup for restoration has to be selected from the tabulated list of backups. The Location field in the table specifies where the backup is stored. The files within the backup can be viewed by clicking on the Browse link against the backup. The files tab opens displaying the files contained in the backup. CTERA admits that seeding the first cloud backup can take a long time depending on the size of the data set, but points out that subsequent backups should proceed faster as only incremental backup is performed. To facilitate quick seeding, CTERA encourages users to take advantage of seeding services offered by CTERA authorized resellers. A seeding hard drive can be prepared from the CTERA C200 device by clicking on seeding in the Control Panel under Cloud Backup. The seeding drive can be optionally encrypted using AES 256 and RSA public key encryption and the seeding destination can be specified. It should be noted that during the process the backup service of the local device is temporarily suspended. CTERA uses a 128 bit SSL(Secure Socket Layer) connection in addition to a 256 bit AES Encryption and a 160 bit SHA-1 fingerprint technology to ensure security of the information that is transmitted to the cloud from the C200 device. The secret user defined or system generated Passphrase provides an additional layer of security. Additionally CTERA claims that the state-of-the-art deduplication and compression technologies used by them speeds up backup. Users can create backup sets (navigation: Main>Configuration>Cloud Backup>Backup files) that contain a folder and its subfolders or a specific folder within a larger folder. Specific types of files or folders can be included or excluded from the backup set. The size of the files selected for the backup set and the amount of backup space available in the cloud backup repository is indicated at the bottom of the page. Included/Excluded sets can be enabled or disabled and backup sets can be added or edited or deleted. Cloud backups can be scheduled (Navigation Cloud backup>Schedule) to be automatically performed periodically or at specific intervals of time or at a specific time or start /stop time or on specific days. A manual backup can be started by navigating to Cloud Backup>Control Panel and clicking Start Backup. Current backups can be suspended, cancelled, resumed or viewed by the user administrator. As with all cloud services there is a concern around throughput. 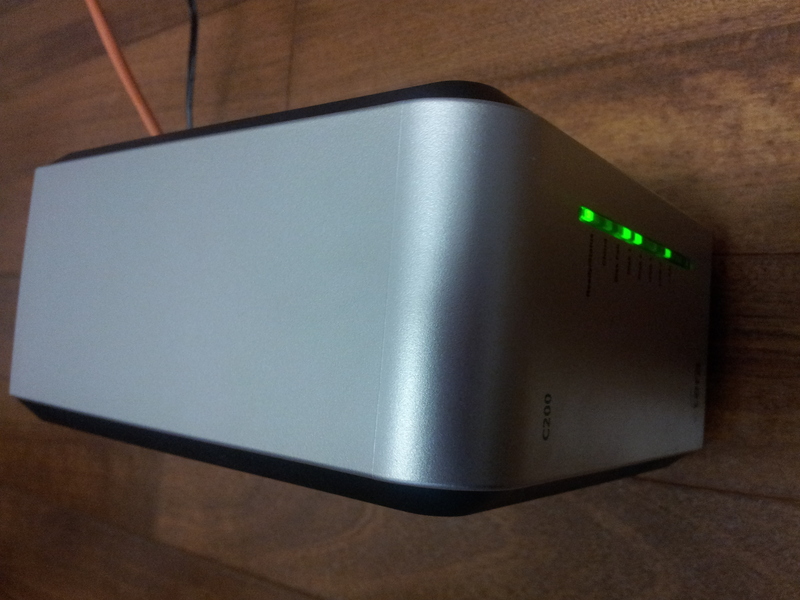 C200 allows bandwidth throttling (Navigation: Cloud Backup>Throughput). Throughput can be unrestricted, restricted, partly restricted or restricted during specific hours of the day. Backup sets in the cloud repository can be restored in a number of ways. Administrators can restore files using the Web Interface’s Cloud Backup Control Panel or accessing the CTERA Portal account or using the CTERA Agent Manager’s Restore Tab. Both Administrators and users can restore backup sets from a cloud snapshot using the Virtual Cloud drive, using Microsoft Windows Previous Versions Interface or from a Cloud/NEXT3 snapshot using the File Manager. The C200 device interface facilitates synchronization of files and folder in numerous ways. Files and folders form any computer on the network can be synchronized with a folder on the device or vice versa without requiring the installation of software agents on the remote computer. It uses the CIFS or Windows File sharing to perform this synchronization. Files synchronization can also happen between two local folders. Synchronization rules can be set up by navigating to local backup>Clientless Backup and selecting the network share and defining the Sync or for cloud backup by navigating to Synchronize > CTERA Agents or Synchronize > Clientless Backup page, click Define Cloud Backup. The Clientless Backup wizard for local or cloud backup appears to guide the user through the synchronization process for the local backup or the cloud backup. The synchronization process/ rules can be manually started/ stopped. File sharing can be enabled or disabled. Specific folders or files on a volume can be shared across the network. The precondition is that the network share must be enabled for the file or folder or volume. Network shares can be managed from the device web interface in List view or folder manager view. The list view displays the list of existing shares and these shares can be added, edited or deleted. The folder manager view displays list of folders and volumes and users can add or remove a network share from a folder or volume. Home Directories can be shared by enabling the share in the privacy configuration settings of the directory. Once the file or folder or volume has been added to the network share, the sharing protocols can be defined. File sharing protocols include Windows file sharing, FTP access, RSync access, Apple File sharing and NFS access. External volume auto sharing is automatic in C200 devices. All authenticated users are automatically given read/write access when an external drive is inserted. The autosharing for specific devices will have to be disabled in the autosharing control lists. Files and folders in the backup of the C200 device can be shared with Guest users who may or may not be part of the device network. The remote access service has to be enabled and the invitation sent containing an URL for web based access from anywhere or specifying the Windows file sharing path for access via the Windows File Sharing (CIFS) protocol. Settings can be tweaked to force guest users to authenticate themselves with the device with a user name and password before access is granted. Collaboration projects can be defined by enabling collaboration in the New Project screen under the Files Tab. The projects can be then edited or deleted from the configuration tab>Share>Collaboration Projects screen. The project members can be added by selecting the members from the Domain users drop down list or local users defined on the list. Project members will receive an email notification inviting them to participate in the collaborative process. Permissions defined for each user will determine the level of activity they can perform in the collaboration. Administrators can enable users to search for files containing specific texts in the document body or file name by enabling a full text search. All types of files can be configured for this facility such as text, source code, PDF, Postscript, Adobe illustrator, OpenDocument, OpenOffice, Microsoft Office, WordPerfect, AbiWord, RTF or Microsoft works. Other file types can be searched with file name only. The search index can be automatically refreshed according to a preset schedule defined by the administrator (Navigation: Search>Full Text Search>Settings>Scheduled Index Updates). The index updates can also be done manually. CTERA C200 is a comprehensive backup system for both local and cloud backup. While the setup takes some time to configure and kick start, the outcomes are wholly satisfactory. The system operates quietly in the background efficiently and effectively. CTERA is not just an external drive, but it is an automated backup system capable of bare metal restore to similar or different hardware as the source from which the data was backed up or to a Virtual machine. CTERA Networks has bridged the cloud storage gap between cloud storage and local storage by revolutionizing storage, data protection and collaboration for SMBs and distributed enterprises with Cloud Attached Storage, offering on-premise storage appliances, with the option of hybrid solution. CTERA has been ahead of the competition by launching their appliance based hybrid solution back in 2008 after realizing the real need for a cost-effective, all-in-one solution for centralized storage and secure off-site data protection. CTERA rightly deserves a four stars on a maximum of five stars. Wow, that is a great review. Very straight forward and clear language. How long did it take you guys to come up with such a detailed review? Gosh!